Working as a Certified Nurse Aide or CNA in Indiana is a fulfilling healthcare career choice because CNAs provide people in a variety of medical and long-term care facilities assistance with meeting their basic needs. CNAs ensure patients and residents get respectful and necessary daily attention while in a healthcare or residential facility, also serving as liaisons between people under their care and other medical personnel. Understanding Indiana laws and requirements concerning Certified Nurse Aides is important to successfully pursue this nursing career. State-approved CNA programs in Indiana are required to have a minimum of 105 hours of instruction, consisting of at least 30 hours of classroom work and 75 hours of clinical training. Not everyone has to complete a training program. It depends on the status of the person. In addition, there are non-certified nursing aides who work in medical facilities. However, to work in a federal or state funded long-term care facility, the nurse aide must be certified. The following steps describe the possible paths leading to CNA certification and inclusion of the nurse aide’s name in the Indiana State Certified Nurse Aide Registry (NAR). The Indiana State Department of Health-Division of Long Term Care manages the Nurse Aide Registry. There are several paths to becoming a Certified Nurse Aide in Indiana. “Application” refers to the Indiana State Department of Health Nurse Aide Competency Evaluation application. There are many state-approved CNA programs in Northern Indiana, Central Indiana and Southern Indiana. Once a student completes an approved CNA program in Indiana, the student is qualified to take the Indiana State Department of Health Nurse Aide Competency Evaluation. Nursing students who have completed a Fundamentals of Nursing course or an equivalent course, and earned a minimum grade of “C” or better, can submit an application. An official school of nursing transcript must be attached. Once the application is approved, the nursing student must take and pass the written portion of the competency evaluation exam to become a CNA in Indiana. A Nurse Aide certified in another state may apply to take the written test in order to become eligible to work as a CNA in Indiana. There are certain requirements that must be met. The CNA must submit an application and attach a copy of a current certification from a different state. The certification form must show the expiration date of the certification and the registry number. There are two states that do not include the registry number and certification date on their forms: Alabama and Illinois. CNAs from those states will attach a letter from their employer that states the CNA worked at least one 8-hour shift in the prior 24 months. If the employer applies for a CNA from out-of-state, the employer will complete and send an Out-of-State Validation Statement. A Certified Nurse Aide from another state must not have any complaints on record. Once the application is approved, the out of state CNA must take and pass the written portion of the competency evaluation to become certified. A student who has graduated from a nursing school within the past 2 years, but has not taken the nursing board exam, can submit the application with an official transcript of credits attached. The graduate student must take the written portion of the exam within two years of program completion. A student who graduated from a nursing school within the past 2 years, and took but did not pass the State Board examination, can also submit the application. An official transcript of credits must be attached. The graduate nurse must take the written and skills test within two years of program completion. A foreign nurse can submit the application. There must be a copy of an official letter of eligibility from an approved agency like the Commission on Graduates of Foreign Nursing Schools. The foreign nurse must take and pass the written and skills parts of the test. A Psychiatric Attendant can submit an application, along with proof of training from an Indiana State facility. The applicant must take the written and skills test sections. A Military Medic who was discharged within the past 2 years can submit an application. Proof of military training must be attached. The Military Medic must take the written and skills test sections to become a Certified Nurse Aide in Indiana. There are 238 (note: number subject to change) CNA programs approved by the Indiana State Department of Health. The large number of CNA classes in Indiana means anyone who wants to become a Certified Nursing Assistant is more likely to find a program that is close to home. Certified Nurse Aide programs are offered at community colleges, private schools, technical schools, high schools, career and vocational training centers, nursing homes and long-term care residential facilities. The following table lists all the approved Certified Nursing Assistant classes in Indiana. You can use the search form to find the right school near you. The school list is updated in May 2017. Decatur Adams R & R Medical Staffing, Inc.
Indianapolis Marion CNA & Homecare Training Center, Inc.
South Bend St Joseph ALR Educational Health Services, Inc. It is important to verify the program is state approved because the curriculum meets federal and state training requirements and fully prepares nurse aide students to take the competency evaluation examination. There are a number of factors besides location to consider when selecting a CNA training program. The factors include program length, clinical locations, costs and availability of financial aid. A good approach is to rank the top 3-5 preferred programs and begin research with those schools. For example, IndyStatHealthEDU is located in Indianapolis and requires completing 30 classroom hours and 75 clinical rotation hours. Vincennes University in Dubois offers a CNA program at its Jasper campus. It also requires completing 30 classroom and 75 clinical hours. All clinical training is located in Jasper nursing home facilities. Some students work and train in nursing homes and long-term care facilities. Students still do classroom work and complete a supervised practicum. Once the student has completed the program, he or she takes the CNA certification exam and is likely to be hired. Per federal law, a Medicare or Medicaid funded facility must cover the student’s training costs and test fees, if the person is hired after training is completed and the student has passed the CNA certification exam. This is true for any CNA, whether trained at the facility or not. However, the CNA must have passed the exam within 12 months of completing the program. This is the equivalent of free training. When assessing costs, it is important to compare similar figures. For example, the IndyStatHealthEDU program fee for CNA includes the CPR card, background check, textbook and uniforms. WorkOne Vouchers are accepted, meaning financial aid is available to some students to cover tuition. The fee of $995 includes textbooks, supplies and state testing fees. The student will have to cover additional costs for the background check, TB testing, uniforms and the physical exam. Federal financial aid programs will not pay for CNA program costs. However, students can apply for financial assistance through their local Indiana Workforce Development office. There may also be scholarships available. If the program cost is not stated on the webpage describing the program, the student can check for an online catalogue. If that is not available, it will be necessary to contact program staff. It is always important to contact the financial aid office and inquire about financial aid availability to cover all or part of the program costs. Students can apply for scholarships or workforce training funds through their local Indiana Workforce Development Office to get free training. 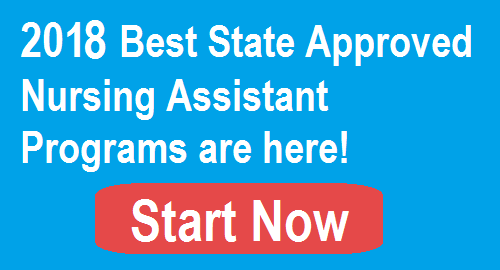 A state approved CNA training program is one approved by the Indiana State Department of Health. The curriculum is periodically reviewed to reflect current standards of care, including federal regulations for Medicare and Medicaid services. The Certified Nurse Aide programs teach students, through classroom and clinical training, what the nurse aide students need to know in order to deliver safe, effective and quality services to patients and residents in long-term care facilities and nursing homes. The curriculum for CNA classes in Indiana covers a large amount of information in the classroom and through hands-on training in clinical settings. Ivy Tech Community College is responsible for administering the Indiana State Department of Health Nurse Aide Competency Evaluation. That means CNA applicants will send the Indiana State Department of Health Nurse Aide Competency Evaluation applications to Ivy Tech rather than the state. Ivy Tech will notify applicants if they are approved or disapproved to take the exam, and will inform them of the time, date and location of the testing. The Nurse Aide Competency Evaluation has two parts: written test and skills evaluation. Ivy Tech Community College provides a practice online written test to help students prepare for the CNA exam in Indiana. The written test has 60 multiple choice question that come from the curriculum material. The skills evaluation test consists of 5 skills that come from four main areas. They are communication, infection control, rights and preferences, and safety and comfort. Ivy Tech Community College determines the location of the test. Each person is allowed to take the written and skills test three times. The Indiana State Department of Health maintains the Certified Nurse Aide Registry. When a student passes the CNA exam, Ivy Tech Community College will send the person’s name to the Nurse Aide Registry. A one-time paper certificate and pocket card is sent to the nurse aide with initial name placement. The CNA status can be verified through this link. CNA certification in Indiana is good for 2 years (24 months). To renew CNA certification, the certification requirements say the CNA must complete a minimum of 12 hours of in-service education and training each year. The CNA must also work at least 8 hours within the 24-month period as a paid employee. The employer provides verification of employment and in-service. Renewals can be completed online through the Indiana Professional Licensing Agency Online Licensing System. An out-of-state CNA can work 120 days but must be certified to work in Indiana as a CNA to remain employed beyond the 120 days.